Plaster panel mouldings can be applied to either ceilings or walls. Corners can be formed by mitring two sections of panel moulding or by linking them with matching quadrant corners (see example of a quadrant corner on the right), or our panel mould square blocks. Design specific quadrant corners are available for most panel moulds, this is indicated on each individual panel mould design. Reference numbers for quadrant corners are obtained by adding the prefix Q to the panel moulding reference, e.g. QPM1 is the code for a quadrant corner for panel mould PM1. Currently the design specific quadrant corners are not shown on the website, please call us if you require assistance. We have three standard sizes of corner blocks to form square panel mould corners, each has their own specific design. If the required design includes a panel moulding in circular or radius form, Stevensons will be pleased to supply a quotation. 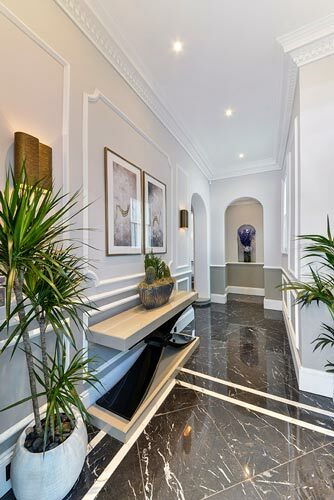 We can also supply preformed decorative plaster wall and ceiling panels, we also have a comprehensive range of standard decorative ceiling designs.